By employing a Multiple-Center-of Projection-Image (MCOP) strategy, I photographed this site from a sequence of views radiating outward from an imagined center point. 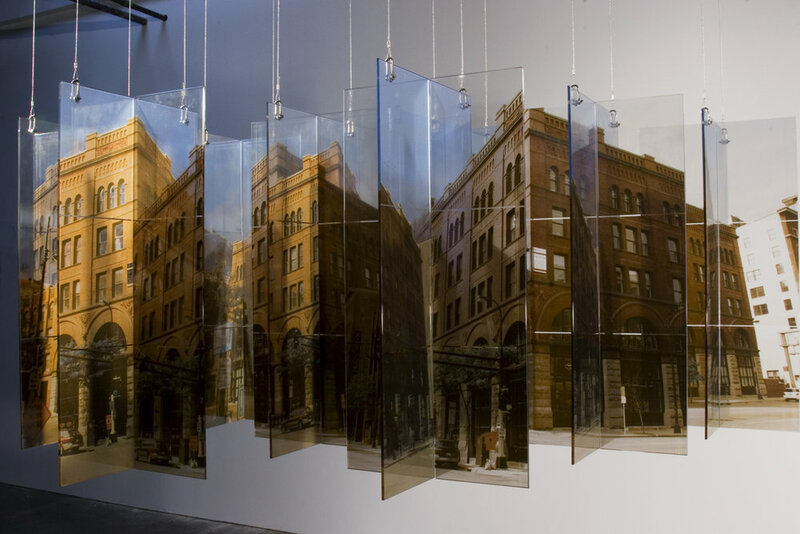 Assembled from digital images fused to intersecting planes of glass, Urban Reduxcollapses and remixes time, space, and place into a single psychological-physical event. Floating and spinning, Urban Redux moves the immovable while reassembling our image, object, and material relationships. Physical forces, tension, mass, light refraction/reflection all synthesize with image projection, a composite construction of our visual and tactile sense of place. DIMENSION. 50”h x 84”w x604”d. MATERIALS. Digital Glass Decals, uv bonded low iron tempered glass, stainless steel hardware and cables.